2 LASER means Light Amplification from Stimulated Emission of Radiation.Laser is created by specific process within the laser device to cause the controlled emission of radiation in form of light.Lasers were first invented by physicist Gordon Gould in 1958 and first working model was built in 1960.They have been used in Europe and America for more than forty years and have been used in fields of dermatology,surgery. opthalmology and physical medicine and rehablitation. Laser is used by physiotherapists for releif of pain,to accelerate healing and decrease inflammation. 5 1.Electron is pumped to a higher energy level. 6 2.Pumping level is unstable so the electron quickly jumps to a slightly lower energy level. 7 3.Electron relaxes to a lower energy state and releases a photon. 8 4.Light and an electron in an excited energy level produces two photons of same wavelength and phase. 9 5.Mirror reflects the photons or laser light is emitted. 12 1.Monochromatic - Monochromaticity refers to the colour or wavelength of the light.Since laser is produced from a single active medium laser light it is of single colour, one wavelength. 13 2.Coherent and Parallel- Due to common wavelengh of laser light ,the phase of each wave is also common.Light travels in sine waves in phase relationship with one another with peak and valleys precisely coinciding and reinforcing each other so laser light travels as parallel beam spreading very little. 15 When the light source is placed against the skin,the photons penetrates several centimeters and gets absorbed by the mitochondria. The energy fuels many positive physiological responses resulting in restoration of normal cell morphology and function but at enhanced rate.Targeted in haemoglobin and cytochrome oxidase,the high power diode laser could help in respiration and then in result have a good performance therapy. LASER means Light Amplification from Stimulated Emission of Radiation.Laser is created by specific process within the laser device to cause the controlled emission of radiation in form of light.Lasers were first invented by physicist Gordon Gould in 1958 and first working model was built in 1960.They have been used in Europe and America for more than forty years and have been used in fields of dermatology,surgery. opthalmology and physical medicine and rehablitation. Laser is used by physiotherapists for releif of pain,to accelerate healing and decrease inflammation. 1.Electron is pumped to a higher energy level. 2.Pumping level is unstable so the electron quickly jumps to a slightly lower energy level. 3.Electron relaxes to a lower energy state and releases a photon. 4.Light and an electron in an excited energy level produces two photons of same wavelength and phase. 5.Mirror reflects the photons or laser light is emitted. 1.Monochromatic - Monochromaticity refers to the colour or wavelength of the light.Since laser is produced from a single active medium laser light it is of single colour, one wavelength. 2.Coherent and Parallel- Due to common wavelengh of laser light ,the phase of each wave is also common.Light travels in sine waves in phase relationship with one another with peak and valleys precisely coinciding and reinforcing each other so laser light travels as parallel beam spreading very little. When the light source is placed against the skin,the photons penetrates several centimeters and gets absorbed by the mitochondria. 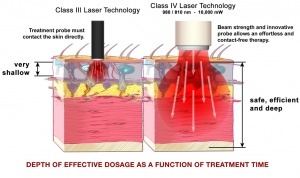 The energy fuels many positive physiological responses resulting in restoration of normal cell morphology and function but at enhanced rate.Targeted in haemoglobin and cytochrome oxidase,the high power diode laser could help in respiration and then in result have a good performance therapy.